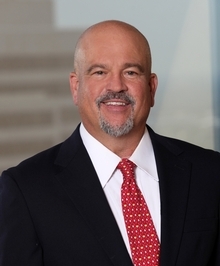 K. Mark Vincent is a shareholder of Vincent Serafino Geary Waddell Jenevein, P.C., where he is primarily engaged in a business litigation practice with an emphasis in real estate and banking litigation. Mr. Vincent has represented clients throughout the state of Texas and has lectured on many topics at various client and CLE functions. He was head of the business litigation section at his former firm, overseeing 20+ lawyers. He has experience in all facets of real estate litigation, including landlord-tenant disputes, option agreements, and purchase and sale agreements. Mr. Vincent is also engaged in creditor-related litigation throughout the State of Texas. Handled various litigation matters involving banks and individuals regarding various contractual disputes and collection of debts. The publisher of Texas Monthly magazine has named Mr. Vincent as a Texas Super Lawyer and previously as a 40 and Under Texas Super Lawyer. Named as "40 and Under Texas Super Lawyer"